It is hard to decide which is the best dehumidifier on today’s marketplace. With Frigidaire FAD704DWD Energy Star 70-pint Dehumidifier, it features top high-end characteristics of a best-selling dehumidifier. This machine is considered as the best among a variety of dehumidifier options. It has great balance among performance, durability, and appearance. Below are amazing features of this advanced model. Pros: Durability, Powerful Energy, Energy saving, Quietness, Sleek design, Large Capacity water, Portability. Cons: Lack of defrost mode. In addition to appealing design, this tool also makes impressive by high durability for years. All parts of the machine are well-constructed, especially water tank and control panel. Being made from sturdier materials, it is quite heavy for carrying but extremely durable in a long time. This model weighs 46 pounds and 12.3 x 17.3 x 25.5 inches in size. Combining well with humidity sensor and built-in humidistat, it effectively shows suitable humidity levels. All you have to do is dialing the humidity levels and ignore it. This smart dehumidifier will do its job well. You actually find that it is completely portable thanks to 4 caster wheels. It is obvious that FAD704DWD is a number one option for powerful and saving energy, multi fan speeds, quietness, great ease of use, and supportive customer service. Check out what benefits you can get from this type of dehumidifier. The humidifier works well in large spaces up to 1400 square feet and reaches 70 pints of excess moisture. As a result, it can capture both small and large pollutants in the air in your room. You will find it effective in removing molds and mildews in big basements, living rooms, and more. Although the dehumidifier is powerful, it saves your bill well due to just only 745 watts in use. Frigidaire is proud of providing quiet motor for smoothly running at night. Thus, you could be rest assured that the machine does not interrupt other people from sleeping. It is so simple to start operating this dehumidifier without any difficulty. This machine comes with different parts for doing multi-functional tasks. You could update specific figures from clear LED display. Coming with easy to control buttons, it boosts the great ease of using this model. Select the humidity levels to match your needs and demands. A big plus of Frigidaire FAD704DWD is that it offers clear manual, which helps users overcome difficulty when setting up the dehumidifier. Like other Frigidaire dehumidifiers, Frigidaire FAD704DWD equips two options of fan speeds, including low and high. The paramount benefit of using the dehumidifier is that it attempts to bring the super quietness to users at both two fan speeds. The unit has bigger water tank than other models in the same category. More specifically, it could store 16.3 pints of water, associated with helpful splash guard for preventing spilling. Most of users feel satisfied with this modern dehumidifier. The product gets positive reviews from thousands of customers. However, a minor plus of this machine is the lack of defrost mode. Averagely, it ranks 4.5 out of 5 stars of customer ratings. Frigidaire is proud of its product quality. It offers one year of warranty for solving any defection of the manufacturing process. 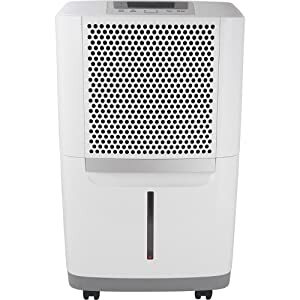 All in all, Frigidaire FAD704DWD Energy Star 70-pint Dehumidifier is a must-have tool in removing moisture in your home. The model is not only easy to use, but also comes with a full package of effective features. If you are looking for a great solution to deal with humidity, let’s pay attention to this machine.